Click the chart for more on Netflix stock. 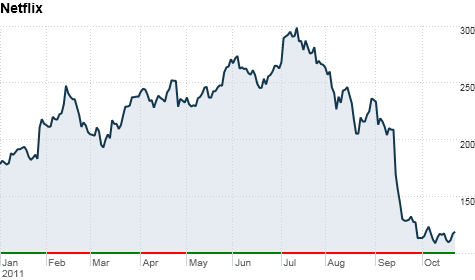 NEW YORK (CNNMoney) -- The Netflix nightmare continues. Shares plunged 35% on Tuesday after the video service revealed that it lost 800,000 subscribers in its difficult third quarter. Netflix (NFLX) earned $62 million, or $1.16 a share, on a record $822 million in revenue in the quarter that just ended, beating analysts' estimates. But shareholders focused on the sharp decline in subscribers and high costs for international expansion. Analysts promptly downgraded the stock Tuesday morning, with one calling the report a "nuclear winter scenario." Shares finished the day at $77.37, after nearly topping $300 in mid-July. Shares started the year around $180 and rallied in the spring thanks to a growing subscriber base. But Netflix kicked off last quarter on a sour note by announcing it would begin charging separate prices for its DVDs-by-mail and streaming video plans, resulting in a big price hike for Netflix customers. As a result, for the first time in years, Netflix's U.S. customer base shrank. Netflix had 23.8 million total U.S. subscribers as of Sept. 30, down from 24.6 million three months earlier. By the end of the ongoing quarter, which wraps up Dec. 31, Netflix said it expects to lose even more subscribers. It forecast that it will have 20 million to 21.5 million streaming customers and up to 11.3 million DVD subscribers in the U.S.
Perhaps even more concerning: Netflix's streaming video service expansion into the United Kingdom and Ireland, announced earlier on Monday, will make the company's overall business unprofitable "for a few quarters" starting at the beginning of 2012. Downgrades pour in: The dour report led JP Morgan analyst Doug Anmuth to downgrade Netflix shares on Tuesday to "neutral" from "overweight." "The long-term potential for streaming-only in the U.S. and international markets remains intact," Anmuth wrote in a note to clients. "[But] start-up costs in Latin America and UK/Ireland are likely to come in much higher than we anticipated." Anmuth also expressed concern about rising content licensing costs. He lowered his price target on Netflix to $67 a share, a steep drop from his previous target of $205. Susquehanna Financial was even more bearish in its note, which was titled "The End of the Road." Analyst Vasily Karasyov cut Netflix to "negative" from "neutral," citing both the subscriber decline and the international costs. "Looks like the nuclear winter scenario is playing out for NFLX," Karasyov wrote. He cut his price target to $60 from $124. Citigroup's Mark Mahaney cut shares to "neutral" from "buy" late Monday night, calling Netflix's situation "a major reset." Mahaney had upgraded Netflix to "buy" in May, but he admitted in his note Monday that "our call has been drastically wrong."